For today's constantly connected consumers, shopping never sleeps. Whether making an everyday purchase or researching a big-ticket item, we reflexively turn to mobile. These I-want-to-buy moments are important for consumers, and they're critical for brands. 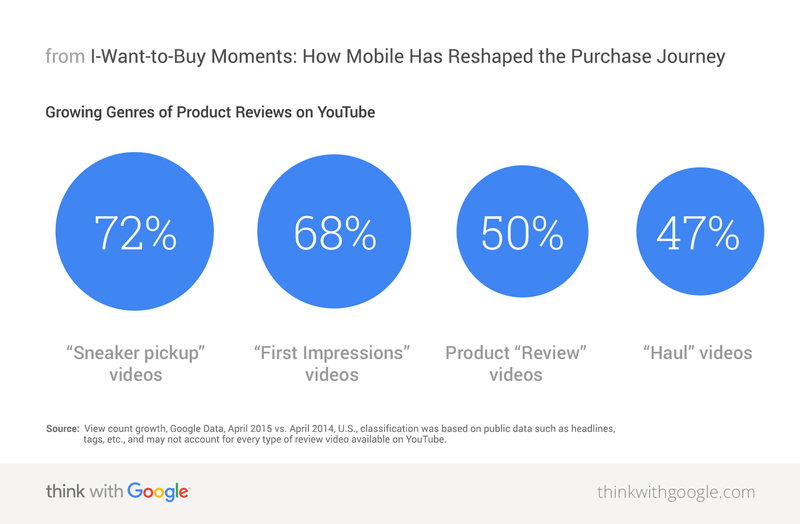 Are you winning these micro-moments? Giana was in her local drugstore, trying to understand why two brands of the same type of treatment differed in price by $15. (The more expensive option coming in a smaller tube, no less.) "I thought there had to be a difference," she recalls. So she pulled out her smartphone and searched for product reviews, right there in the store aisle. She ended up going with the higher-rated, yet higher-priced product. Looking back, Giana realizes that had she not had her smartphone, she probably would have bought the cheaper one. Erica was at the airport, killing time before a flight, when she searched for a mortgage calculator. She wanted to figure out whether she and her husband could really afford a new home. That first smartphone search led to many more in stolen moments throughout her day as she researched the purchase step by step. "Being able to do it in the moment makes it more fun and less daunting," says Erica. "I can space it out throughout my day." Some marketers might see this as a threat and wring their hands about "showrooming," because they are concerned that consumers will end up buying products elsewhere. But savvy brands see it differently. "We think one of the biggest opportunities that we have in retail is for our customers to leverage their phones as a shopping assistant when they're standing in the store," says Sephora's vice president of interactive media, Bridget Dolan. To assist shoppers in these moments, Sephora designed its app to pull up product ratings and reviews when an item is scanned. "Having access to this information is that perfect new moment for customers to find everything they're looking for and get advice from Sephora." Dolan and her team also realized that people were searching for products on mobile before heading to a physical store. To reach shoppers in these critical moments, Sephora began using local inventory ads to let customers know when particular products, such as lipstick, eyeliner, or perfume, would be available at a nearby store. This helped drive shoppers into stores, and they often bought more once they arrived. "A client that really knows exactly what she's buying—all the reviews and all her options—is actually a happier client and will come back and shop with you more often," says Dolan. When searching in the moment, we often rely on reviews. In one study, more than half of millennials surveyed said they check product reviews on their phones while shopping in a store4—and YouTube has become a top source for reviews. These I-want-to-buy moments are important moments for consumers, and they’re critical for brands. Source: View count growth, Google Data, April 2015 vs. April 2014, U.S., classification was based on public data such as headlines, tags, etc., and may not account for every type of review video available on YouTube. I-want-to-buy moments aren't just important for low-consideration purchases. As we saw with Erica, they also happen when we're making big decisions such as investing in a new home, booking a vacation, or buying a car. In the auto category, for example, searches on mobile are growing 51% YoY.8 "Today's path to purchase is more dynamic than ever before," says Dionne Colvin-Lovely, director of emerging and traditional media at Toyota. "Car shoppers leverage mobile at the beginning and middle of their purchase process and continue to research and shop online while at the dealership." This constant access to information means that immediacy and relevance are now table stakes for brands. "Mobile's rapid evolution is changing the expectations of today's car buyer," says Colvin-Lovely. "We want to make it easy for our customers to discover the information they are seeking about Toyota as they search, read, and watch auto-related content. To do so, we leveraged a variety of mobile tactics—from high-impact sponsorships and takeovers to dynamic, hyper-targeted, location triggered placements—to ensure Toyota remains top of mind during these key moments," she says. Source: Google Trends, United States, 2008–present. 1. Identify your consumers' I-want-to-buy moments. Talk to them—in stores, through surveys, in focus groups and forums—to figure out when and how they're researching and making purchase decisions. 2. Be there in these moments of need. Create a comprehensive strategy that works holistically across channels such as search, video, social, and display. Keep in mind that consumers may be at home, in store, or somewhere in between. 3. Deliver relevant messaging. Simply being there in these moments isn't enough. Look at how people are searching—the questions they ask, the terms they use—and create ads and content that provide helpful answers. 4. Make it easy for them to make a purchase. The step from research to purchase should be a simple and seamless one. Give the consumer multiple ways to buy—whether that means driving them to your e-commerce site from a YouTube video or from a local inventory ad to a nearby store. 5. Measure every moment that matters. It's no longer enough to simply measure the online conversion. With mobile, the path to purchase is now fragmented. As a result, advertisers need to measure results online, across devices, in apps, and even in stores. 1 Google/Nielsen, "Mobile Path to Purchase" study, November 2013, United States. 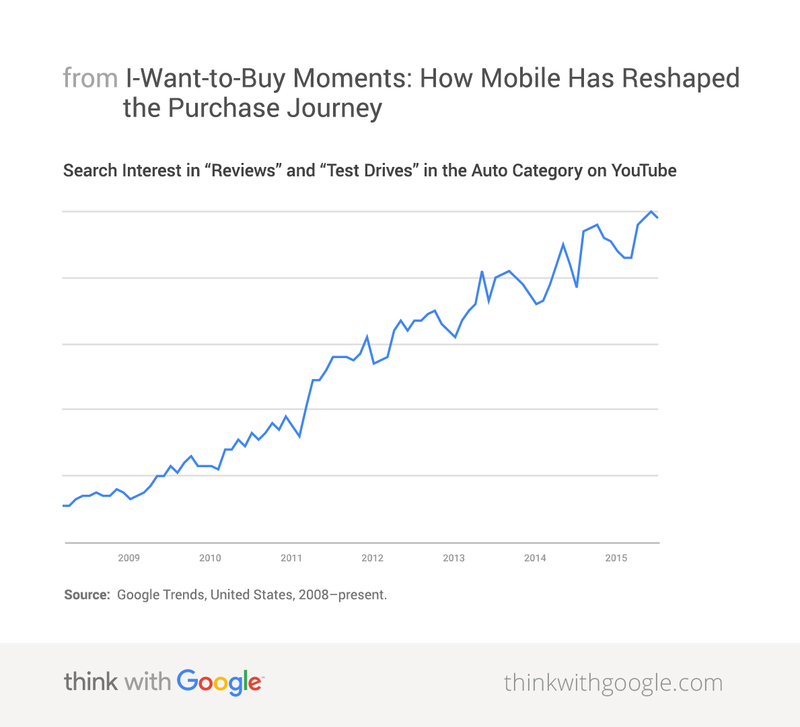 2 Google/Ipsos, "Consumers in the Micro-Moment" study, March 2015, United States. 3 Google Consumer Surveys, April 2015, United States, n=1130. 4 Google Consumer Surveys, April 2015, United States, n=365. 5 Google Data, April 2015, global. 6 Google Data, April 2014 vs. April 2015, United States. 7 Google Data 2015, United States, brand interest measured via search volume/activity on Google.com. 8 Google Data, Q1 2014 vs. Q1 2015, United States.